If you were hoping for massive changes to iOS, such as a redesigned Home screen, iOS 11 will disappoint you, at least on the iPhone. While the iPad will receive many terrific (and much-needed) big-screen features (see “iPad Pro Gets More Professional,” 5 June 2017), the rest of iOS 11 focuses on UI refinement, artificial intelligence, and developer capabilities. Regardless, some big changes are coming when iOS 11 is released this fall. Control Center and Lock Screen — Whenever you install iOS 11, the first big thing you’ll likely notice immediately is the new Control Center, which had ballooned to up to three pages in iOS 10. For iOS 11, Apple has compressed it back down to one page, in a grid that takes up more of the screen. Despite being squeezed into a single page, Control Center will offer more options than before. 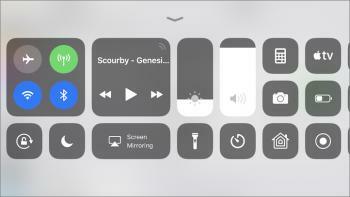 You’ll be able to 3D Touch a Control Center “platter,” as Apple called them, or presumably long-press it on devices that don’t support 3D Touch, to pop open a panel with more options. The other big front-facing change is that Notification Center is going away in iOS 11. Instead, you’ll be able to scroll through all of your notifications on the Lock screen. It wasn’t quite clear how you’d be able to see your older notifications without locking the device. Messages — In iOS 11, Apple is finally fixing Messages with Messages in iCloud. Your messages will be synced across devices via iCloud, so you won’t have unsynced or jumbled messages. If you delete a message on one device, it disappears on all devices. Also, your older messages will be stored in iCloud so they won’t hog precious storage space on your devices. Of course, your messages will still be end-to-end encrypted to ensure your privacy. Apple Pay — Apple is becoming a financial services company of sorts, since Apple Pay will support person-to-person payments in iOS 11. To store the money you receive, you’ll have an Apple Cash Card in Wallet, and you can transfer money from it to your bank. Apple was a bit skimpy on details, but it seems that the primary way of making person-to-person transactions will be with a Message app that can send money via iMessage. Siri — Siri will receive some major enhancements in iOS 11. In addition to new, more natural voices and a new look, Siri will now sync the data it knows about you between devices to better help personalize your queries. Siri is also getting smarter. Thanks to what Apple calls Siri Intelligence, Siri will better understand your interests and the contexts in which you are speaking. For instance, if you search for Iceland in Safari, Apple News will recommend articles about Iceland, and the keyboard will intelligently suggest related terms. Apple has spread this intelligence throughout iOS 11. For instance, Calendar can now extract events from Safari. This is one of those features that’s difficult to demo or describe, so we’re anxious to get our hands on it to see how it works in reality. Unhappy with the results Siri usually gives you? In iOS 11, Siri will offer alternative answers that you can choose by tapping the screen. Presumably, Apple will use this to tailor its recommendations. Perhaps the coolest new feature coming to Siri is translation. You’ll be able to say something like “How do you say what the most popular dishes in your restaurant in Chinese,” and Siri will speak what you said in Chinese. Apple emphasized that this is a beta feature, so we don’t quite have the Babel fish from “Hitchhiker’s Guide to the Galaxy” yet. Finally, the SiriKit API for developers is gaining some new features, such as photo search, car controls, task management, and banking. That should mean that we’ll be able to use Siri to control many more apps than in iOS 10. App Store — Apple is totally revamping the App Store in iOS 11. The old top charts seem to be gone. Instead, there are tabs for daily featured apps, games, and apps. Apple seems to be moving toward curating the App Store more. Apps featured in the Today tab will include short articles and how-to videos. Likewise, the other new tabs will feature highlighted apps every day. The idea seems to be to get users to check in with the App Store every day to see what’s new. That may be great for developers, but we’re horrified that Apple seems to think you should waste vast amounts of time browsing the App Store for new apps daily. Developers will appreciate the App Store’s new “phased releases,” which roll out a new or updated app slowly instead of all at once. That’ll be especially welcome for developers whose apps require a lot of server resources. Camera — Have you noticed that the file sizes for photos are growing with each new iPhone model? Apple is tackling that with two new technologies: HEVC H.265 video compression and a new image format called HEIF. Apple claims that HEVC compression can cut the size of videos by half. HEIF, or High Efficiency Image File Format, is a new file format standard that will replace JPEG for iOS photos. Apple claims that images in HEIF will be easy to share with others, but we’re waiting to see how well that pans out. Portrait Mode for the iPhone 7 Plus is also getting some much-needed enhancements: improved image quality, better low-light performance, and optical image stabilization. Photos — The Memories feature that Apple introduced in iOS 10 is getting smarter and better able to identify different objects and people, but the change you’re most likely to notice is that Memories in iOS 11 will be able to switch from landscape to portrait orientation. But the most impressive new stuff coming to Photos in iOS 11 is all the things you’ll be able to do with Live Photos. You’ll be able to trim and edit Live Photos, pick a different key photo, and create loops. You’ll even be able to reverse the directions of loops if you want a bounce effect. But perhaps the coolest new feature with Live Photos is being able to combine all the frames together to form a long exposure shot. Maps — As always, Apple’s Maps is playing catchup. Maps in iOS 11 will inform you of speed limits and offer lane guidance — standard features on most standalone GPS units. However, more interesting is that Maps will begin offering indoor maps of large places like malls and airports. Support will be limited to a small number of major cities at first, but that will hopefully grow over time. CarPlay for the Rest of Us — Even Apple admits that CarPlay hasn’t been widely adopted, so that’s why the most interesting new automotive feature will be available to all iOS 11 devices: Do Not Disturb While Driving. When your iPhone detects, either via Bluetooth or the Wi-Fi Doppler effect, that you are in a car, it will shut off notifications to your phone. You’ll be able to set an auto-reply text message in case anyone messages you, which the sender can break through by stating that the message is urgent. You can also turn off Do Not Disturb While Driving if you’re riding in a car instead of driving. We strongly hope this feature will help cut down on the number of accidents caused by texting and inappropriate iPhone use while driving. HomeKit — Apple’s home automation platform will gain some more capabilities, but the key thing Apple wanted to discuss is the new AirPlay 2 protocol and its integration with HomeKit. If you have multiple AirPlay 2 enhanced speakers, you’ll be able to use the Home app to broadcast music throughout your house. A number of manufacturers have signed on to produce AirPlay 2-compatible speakers, and we presume Apple’s own HomePod will do so as well. Apple TVs running tvOS will also be able to act as AirPlay 2 receivers. I hope this musical HomeKit integration will let me do things like play a song in response to an event or even sync my lights to music. Apple Music — Remember Ping? Or Apple Music Connect? Well, Apple just won’t give up on the dream of a social music experience, so Apple Music in iOS 11 will let you see what your friends are listening to. We hope you can turn that feature off; there’s a reason each of Apple’s previous attempts in this area has failed. Apple is also offering developers an API for Apple Music, so developers of apps like Shazam can tie into Apple Music. It will be interesting to see what developers do with that. Behind the Curtain — WWDC being a developer conference, Apple announced some new technologies that could lead to new, exciting apps. The two most interesting ones for end users are Core ML and ARKit. Core ML is a developer framework to make machine learning readily available to developers. Developers can use it to handle things like face detection and tracking, text detection, object tracking, palm rejection, and barcode scanning. Apple claims that with Core ML, iOS image recognition will be six times faster than with Google’s Pixel phone. ARKit is a framework to help develop apps using augmented reality, which mixes the real and virtual worlds. The example most people are probably familiar with is Pokémon Go, which lets players capture and battle with pocket monsters around the world (see “What the Heck Is Pokémon Go?,” 17 July 2016). Apple even demonstrated how ARKit will make Pokémon Go better by showing that a thrown pokéball will bounce around on a real-life sidewalk. Apple senior vice president Craig Federighi also showed how an ARKit app lets him place virtual objects on a table. And Alasdair Coull, head of director Peter Jackson’s Wingnut AR studio, showed off an entire battle overlaid over the auditorium. AR is an interesting technology, but it has yet to find a killer app. Pokémon Go seemed to be the app, but its luster has quickly faded. However, if Apple ever did develop a car, AR could be an essential technology.